Research Paper (postgraduate) from the year 2010 in the subject Environmental Sciences, grade: A, Central European University Budapest (-), course: -, language: English, abstract: Rapid population growth and enormous urban and coastal developments have increased the anthropogenic pollution into the oceans. Human activities may responsible for the decline in biodiversity and productivity of marine ecosystems, resulting in the depletion of human marine food resources (Jenssen, 2003). Furthermore, the marine environment is an important resource for human welfare and health and fortunately in recent years awareness of its intrinsic value has increased (Derraik, 2002). One particular type of threat to marine ecosystems is the pollution from plastics. These particles are a serious treat to the marine biota and human life and entail significant economic and social costs. Further, they reduce the aesthetic and perhaps intrinsic value of the marine environment (Jenssen, 2003). 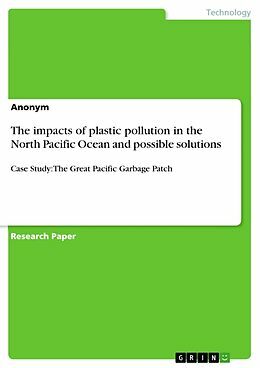 The aim of this paper is to examine the threats from plastic pollution and introduce an interesting case study from the North Pacific Ocean. The paper will describe the current policies and propose market based instruments which can provide solution to the issue.